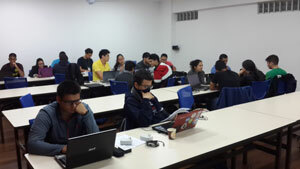 On March 31, 2017, a team of Smartenit engineers presented Smartenit World of IoT to an enthusiastic crowd of students at the University of Quindio (Universidad del Quindio) in Armenia, Quindio, Colombia. The presentation was in partnership with the University as part of a larger workshop on Internet of Things technology. 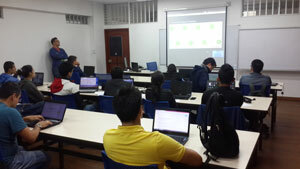 A team of Smartenit’s technical and embedded systems engineers took over 20 interested students through a presentation that explained mission and vision of Smartenit, the company’s history of expanding IoT technology and making it a tangible experience, the Smartenit IoT framework and ecosystem, and general IoT theory and protocols. Students were also given the opportunity for practical experience through a group-driven coding session. Interested in having Smartenit present a workshop at your University? Please contact Sammy Korotie at sammy.k@smartenit.com.